We’ve got Chad Wingard as a MID/FWD now for the Power and we’re all hoping that Jared Polec can make the side in Round 1 due to being so cheap. New recruit Jared Polec ($135,500) will be a deadset bargain if he’s selected in Round 1. 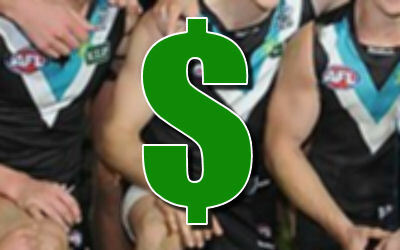 A lot of coaches are thinking long and hard about Chad Wingard ($474,000) due to his MID/FWD status. Yes for Polec and No on Wingard. I agree that if Polec is selected for the round 1 game he will be a walk up start. Wingard I don’t know if he is worthwhile and has the ability to increase his point scoring ability. I agree Kirk. Wingard I don’t think will be very big points scorer. Have we ever seen 3rd year blues? That’s my prediction for Wingard. Opposition coaches know he’s a game-winner now. It is possible some years are worst than others. being an injury or just poor form. I will risk pick him because he won All-Australian last year and I think he may have a down season. *Recorrection* It is possible some years are worst than others. being an injury or just poor form. I will not risk pick him because he won All-Australian last year and I think he may have a down season.